Is Hasa the only Liquidator on the market? Is Stenner something you buy off the shelf or build? I am looking to move from tablets & LC to just LC. Liquidator is a brand name product sold by HASA. There are no other makers of a system like that. Stenner is the name brand of a peristaltic chemical pump. You can order a complete Stenner setup (pump, tubing, valves and storage tank) or source the components individually and build it yourself. Liquidators don't work well with variable speed pumps and often develop white flaking / calcium scale in the tank. 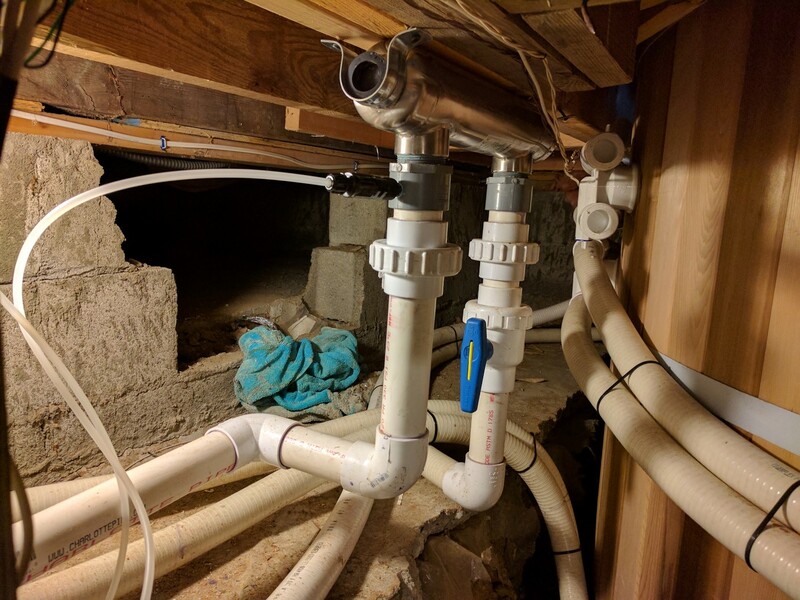 Stenners work independent of system pressure and flow but their tubing requires annual changing and the check valve that plugs into your plumbing needs periodic inspection to check for salt crusting and build up of deposits. Yes, the Liquidator is patented/trademarked by HASA. The Stenner is a commercial liquid chemical pump, not necessarily a pool specific item. When you buy the pump you can buy it bare (no accessories) or buy all the parts you need (tubing, check valve, tank ect.). Personally I purchased a pump with all accessories except the tank. I have a Liquidator, and it works as advertised. After one year, I have had no mechanical issues or workmanship issues at all. HOWEVER... for my particular use case, I do not think it is the solution for me. Let me explain. My pool was built about a year ago, and I had already spent six months lurking on TFP, so I knew I wanted to go the liquid chlorine route. The problem was, it was very difficult for me physically to get to ground level, add chlorine without splashing, and get back up (yes I am old, football injury, etc., etc.). So the Liquidator was attractive. Install was super easy. Got a cement paver to put in on, all that. And it does just what it is supposed to. My pool is on the larger side, so I got the 3/8 model upgrade, and it can keep up with my 30k here in devastatingly hot Texas no problem. My only issue with the LQ was that I could only add about two or maybe three gallons of bleach at a time, or else the tank would overflow or otherwise overflow the funnel where you are supposed to add the bleach. Then it takes, IDK, an hour or so of pump run time for the level to drop, so that I can add another gallon or two. So while my goal was basically to add 8 gallons of bleach for the week on Saturdays, to do that more or less took all day. And it was not convenient to go outside and get hot and sweaty 4 times every Saturday (did I mention it gets HOT here?). Now, to be fair, perhaps I was doing something wrong. If anyone can explain to me how to add 8 gallons of bleach to the LQ in one trip I will appreciate it. I really like that thread! Do you have a part list? I saw that one person preferred the fixed rate Stenner pump as it was less maintenance. I have a 40,000 gallon pool (single speed pump) & then a separate 600 gallon hot tub (dual speed pump). Ideally I would like to buy identical parts (maybe not the liquid chlorine tank sizes) in the event of a failure I would have spare parts handy if needed. 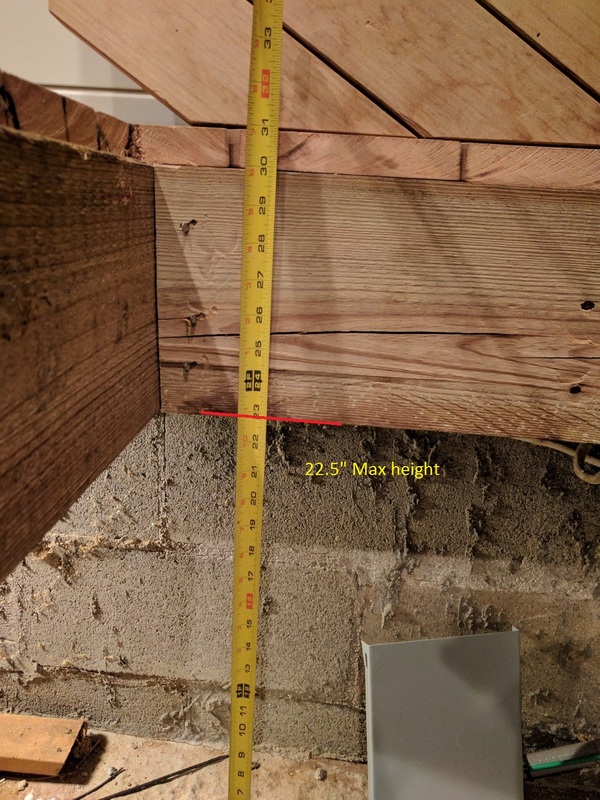 How would i figure parts i need? Electrical seems pretty straightforward. It sounds like your mostly happy but the LC tank is too small? I originally was thinking of the liquidator but the survey seems like most people on TFP prefer the stenner. If anyone can explain to me how to add 8 gallons of bleach to the LQ in one trip I will appreciate it. Change to a higher concentration of chlorine. Assuming that by saying "8 gallons of bleach" you mean that your using 8 121 oz jugs of 8.25% chlorine, then by changing to 128 oz jugs of 12.5 % chlorine you will only need about 5 jugs a week. Another thing I do is to shut off the in flow and fill while the pumps is running. But your right it is somewhat of a pain to fill more than three gallons at a time. I tend to fill mine it at least twice a week. So i am playing around with going LC only on my hot tub (600 gallons). Yesterday I went from FC of 8 to a FC of about 1.5 within a 24 hour period. I always keep it at 102f 24/7. Based on pool math of going from 1 FC to 5 FC it said to add 2.5 ounces of 12.5% LC. I was looking at the stenner pumps but i think that pumping 2.5 ounces per day might be to little for a stenner pump. I can bump it down to the 8.5% off the shelf bleach but that only nets me 3.4 ounces. 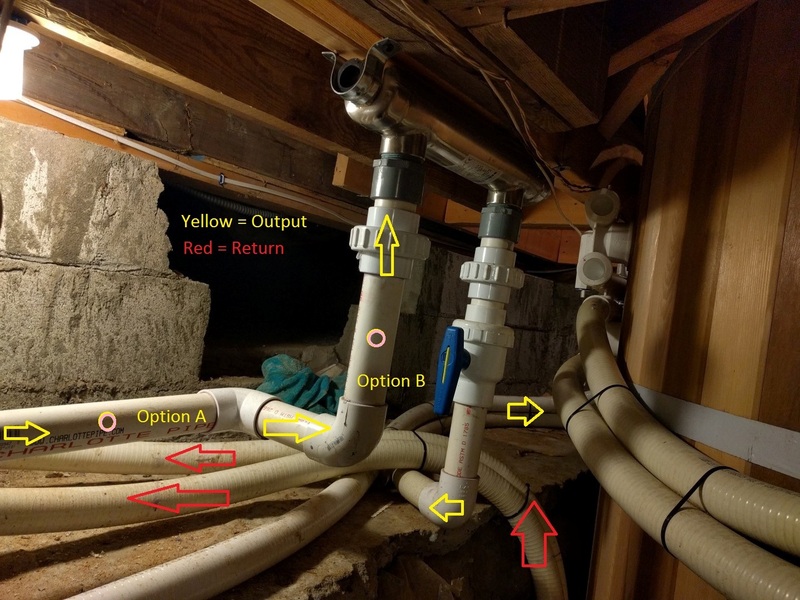 Can I make a Stenner pump work for my 600 gallon hot tub? EDIT: Am I doing the pool math right? If you get the 3gpd pump, running it for 10 minutes would inject about 2.5 oz. You can get an electronic timer that you can set to the minute, so it would allow you to get really close to the amount you need to inject. You could even divide the run time so it's spreading out the injections. So I called Stenner today & asked a number of questions about the pumps. I think I got a good edumication! If I am looking to put 6 oz of chlorine per day into my tub, I need a timer to run roughly for 22 minutes. .27 oz per minute * 22 minutes = almost 6oz. They started suggesting using the adjustable unit as they said I might need a ORP controller if I used a fixed unit (technically if you get an inspection). She said the plates werenÂ’t a big deal to change out. I assume that the these times are based on a 1/4 Â“ line vs the 3/8Â” tubing. 45MPHP2 with the #1 hose. I do understand that the adjustable one allows much more detailed controls but i dont know if its worth the trouble of changing plates at a later point considering i would likely be running it on low. I bought an adjustable rate pump because I planned on running it as long as the main pump ran. I have since set it to 100% (10) and use a timer to inject the correct amount of hypo into the pool. When I replace that pump it will be with a fixed rate pump. The adjustable rate mechanism makes a clicking noise and will make people ask you what the heck is that? Repairing those pumps is relatively easy even the adjustable rate mechanism isn't too difficult if you're handy. The 1/4" vs. 3/8" doesn't have any effect on the flow rate. The larger feed/discharge tube is for highly viscous liquids (think Honey or mayonnaise) The pump tube (#1 thru #7) determines the flow rate. I would recommend getting the UV stable black tubing if it's going to be exposed to the sun. But 1/4" will be fine for bleach. You don't want to try to use ORP on a pool with CYA in it. You're better off with a timer. The 45MPHP2 is a 3gpd high pressure model. That basically means that it will pump 3 gallons per day if you run it 24 hours a day. The high pressure designation means that it comes with and injection fitting instead of just a ductbill. The pump tube actually determines whether it's a high or low pressure model. Several of the tubes will handle the 100PSI, only a few sizes are restricted to 26PSI. That timer looks like it will work, but the manual doesn't specifically say that you can set it for one minute. Though it looks as though you can. Another thing I like about the Stenner pumps is that if you find out that you should have bought a different sized pump than you did, all you have to do to change flow rate is change the pump tube to a different size. So based on what i think i need for the indoor 600 gallon hot tub - it will range from about 5 to 7 oz of LC per day (about what I do now). I may go for two 3 oz cycles as the tub has 4 sanitation cycles per day. I figure if I am using the tub I can always add some LC manually. 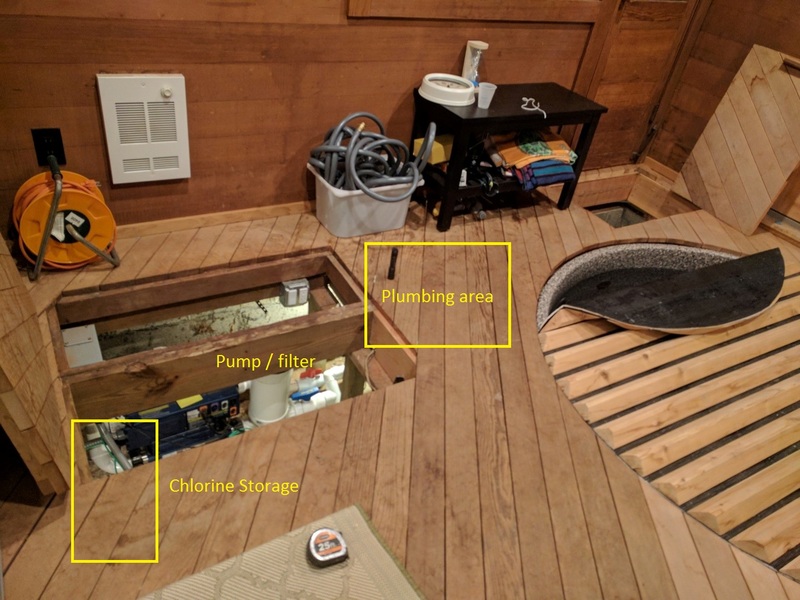 My main tub area (with hatches open) - chlorine storage on left, plumbing in middle. So i am limited by height (23) inside the studs is about 14" so I am also limited by width to get a container in that area. Its a 6 gallon tank & has what i think I need. Or this: 5 Gallon HDPE Stackable Container with 70 mm Vented Cap | U.S. Plastic Corp.
128*5=640oz / 8 oz per day = 80 days per tank. So I am thinking of either option A or B - I am thinking on whats easier to fix if i mess it up. I am leaning towards option A. Lowes has a 1/4NPT tap kit. I am guessing this will work. I think i am ready to go. The storage tank / is a little fuzzy for me but I can start with a gas can & move it to something else in the future if needed. I have no idea if you are a do-it-yourself kind of pool person or not but I just switched to LC injection using a few simple parts from eBay. 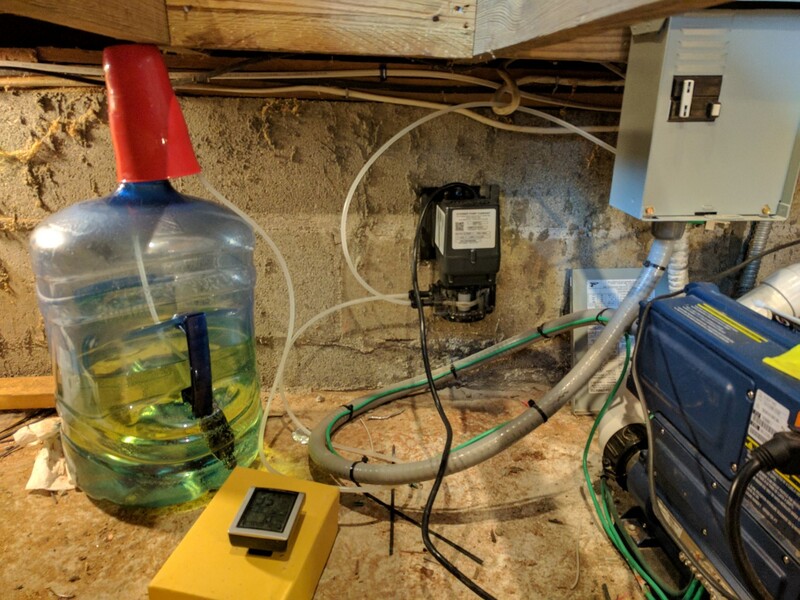 A $12 pump, an $8 transformer, a 5-gallon see-through jug and an old re-purposed sprinkler timer. I don't need a variable speed injection pump because I can easily adjust the minutes of run time on the sprinkler timer. I can even set a manual chlorine "boost" without affecting the daily programming. The pump injects about 2 ounces per minute. I can inject once a day or up to 4 times a day if I wish. I set the sprinkler timer to turn on only when the pool pump is running and inject on the suction side of the pump through a small hose barb. 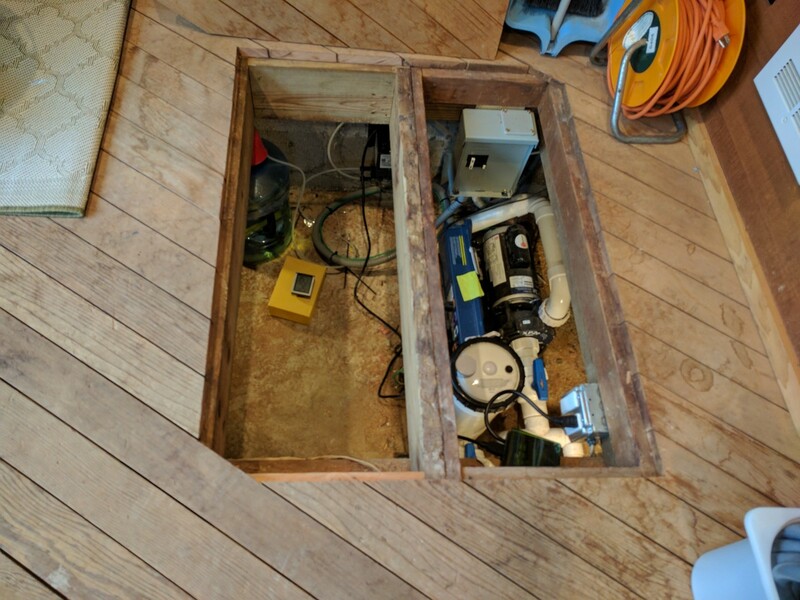 All the gear is inside my nearby tool shed so I don't need it to look pretty or be waterproof. I ran a 1/4" diameter black plastic drip tube from the shed to the pump. My acid needs are low so I do that manually. Could you please post details of your injection system? I am looking at Stenner for injection, but their pumps look like overkill for simple pumping chlorine into a pool. Quick note...injecting into the water line returning to the pool - after the filter, heater, etc - involves only low pressure. Thinking 10psi or less since pre-filter P only ranges 12-25psig max.? I did order my Stenner pump but it wont be here for 5-10 business days – after I am traveling. I am OK using a stenner on my 40,000 gallon pool but I would love to DIY something smaller for while I am traveling. Slickraft, Could you please post details of your injection system? Yup. Don't want to hijack further. I'll get some pics and details and either start a new thread or add it to the big DIY thread about LC or MA injection ideas. Give me a few days. I post back here when the info is ready to view. I am using a poland spring bottle as my container as i am a bit short on space. My pump runs at .31 oz per minute vs the .27 in the manual - i guess every pump is different. So I have it pumping 10 minutes at 11am & 10 minutes at 11pm giving about 10 oz of 8.25% per day & it works well for the last few days. During heavy bathing I will manually run the pump for a few extra minutes but I am interested to see how it all works out during my traveling. I am aiming for 7ppm of LC. I would like to get a better container. My wife is sensitive to the bleach smell - I am guessing the 'cup' on top isnt doing a great job keeping in the fumes (but it keeps out the dust).